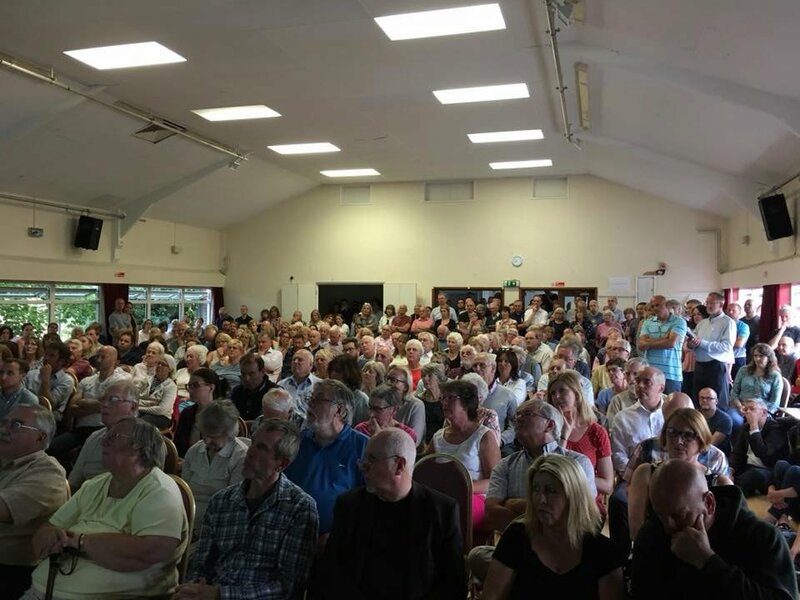 Borough Green Village hall was packed to the doors and beyond at a meeting on Friday night called by the Parish Alliance of Borough Green, Platt, Wrotham, Ightham, Plaxtol and Shipbourne, with members of all parishes present. TM Boro Councillor Mike Taylor talked about the development of the plan, without the usual blarney about how good it was for the village, and then took the audience on a slide show aerial tour of the site, It isn't until you see it from the air that the sheer vastness of the site becomes apparent, and how many huge excavations have to be filled before any development can begin. Pete Gillin, Chairman of Wrotham PC spoke about the hazardous waste at Ightham Sandpit, and other historic landfills that blight the site. KCC Councillor Harry Rayner spoke about the Mineral and Waste implications of the site, and how transport infrastructure needed serious upgrading to cope. TM Boro Cllr Tim Shaw spoke about the loss of Greenbelt and AONB, and how the development would add hugely to the existing Traffic and Air Quality issues. Borough Green Centre is already an Air Quality Management Area, based on 2009 figures, and that is without the steady 1000 vehicle increase annually since that time. TM Boro Cllr Robin Betts spoke about the impact on our rural way of life, and the loss of individuality of our villages as a part of a new urban sprawl. There then followed a good natured but anguished period of public questions, answered in turn by the speakers. Even those who support provision of affordable housing balked at the sheer size of the proposal. TMBC Cabinet Members and Planning Officers had been invited to give their side of the argument, but declined. The purpose of the meeting was to inform local people of what TMBC are planning for us, but more importantly for the Parishes to gauge public opinion for digging in our heels and fighting, and whether that support extended to using Parish Funds to employ professional representation at the Inquiry next year. The answer was an overwhelming "YES"
Such was the demand for places at this meeting that 15 minutes before the start we had to close the doors, and a second meeting will be held in September to update on progress, and to allow those who missed out on Friday to have a chance in the future.